Barysaw (officially transliterated as Barysaŭ, Belarusian: Бары́саў [baˈrɨsaw]; Russian: Бори́сов, Borisov [bɐˈrʲisəf]; population 180,100 as of 2013) is a city in Belarus situated near the Berezina River in the Minsk Region. Barysaw is first mentioned in the Laurentian Codex as being founded (as Borisov) in 1102 by the Polotsk prince Rogvolod Vseslavich (baptismal name Boris). During the next couple of centuries it was burned and then rebuilt slightly south of its original location. On 22 January 1796 the town's coat of arms was established (decree #17435) by Stanislaw August, the top half containing the coat of arms of Minsk, while the lower half had two stylized towers on a silver background with a passage between them and Saint Peter above the towers holding a key in his hand. At that time, Barysaw was an uyezd town. In 1812, Barysaw became a crucial location when Napoleon's troops crossed the Berezina river. The French feinted a crossing at the town itself, but successfully escaped the pursuing armies by building two wooden bridges north of the city, at Studianka. This event is reenacted by military locals during town festivals. A cannon from the Napoleonic era is kept by the town's museum. In 1871, the railway between Brest and Moscow passed near Barysaw, and a station was built there. In 1900 the area around the station was annexed the town. In November 1917 the area became a part of Soviet Russia but was occupied by Germany and then Poland from 1918 until 1920 after which the Belarusian Soviet Socialist Republic was established. Since May 1948 the city has been home to the headquarters of the 7th Tank Army, which became the 65th Army Corps and then the North Western Operational Command of the Armed Forces of Belarus in 2001. In 2000s the Head of City Administration, or Mayor, was Vassily Burgun. After World War II Barysaw became a major industrial centre, and as of 2002 there are 41 large factories, whose goods are exported to Russia, the CIS, and abroad. The railroad is still an important artery, but now it is powered by overhead electric lines. List of industries: Borisov Plant of Motor-and-Tractor Electric Machinery, Borisov Plant Avtogydrousilitel, Borisov Aggregate Works, the Ekran Company, Dzerzhynski Crystal Works, Borisov Plastics Plant, the 140th Repair Works, the 2566th Plant on Radioelectronics Equipment Maintenance, the Rezinotekhnika Company, Borisov Meat Packing Plant, Borisov Plant of Polymer Package Polimiz, the Belarusian-German joint venture Frebor, the Lesokhimik Company, the Metallist Company, the Paper Factory of the state emblem department under the Finance Ministry of the Republic of Belarus, the Borisovdrev Company, the Borisovkhlebprom Company, Borisov Bakery, Borisov Sewing Factory, the Shveinik Company, Kischenko Crafts Factory, Borisov Dairy, Borisov Tinned Plant, others. The total industrial staff reaches 31019 people. The town is divided by river into old and new parts connected by two bridges. Railway station, international road, Ispolkom (ex-KPSS Gorispolkom), military staff and central place are in the new part. As usual for this region, families live mostly in flats in large, modern apartment buildings, but there are some single-family homes on the outskirts, some of which do not yet have indoor plumbing. The water comes from an artesian well and is very clean and healthy. President of the Republic of Belarus Lukashenko January 9, 2009 has assigned Vladimir Miranovich to the position of Head of Regional Administration (Ispolkom). Official “Adzinstva” newspaper in Belarusian. Football team BATE Borisov are based in the city. They have won the Belarusian Premier League eight times, and competed in the UEFA Cup and UEFA Champions League. There is also a famous basketball team Berezina-RCOR. European basketball championship for women (division B) was organized in Barysaw. ↑ "Численность населения на 1 января 2015 г. и среднегодовая численность населения за 2014 год по Республике Беларусь в разрезе областей, районов, городов, поселков городского типа" [Population as of 1 January 2015 and 2014 year-average population in regions, raions, towns of Republic of Belarus] (in Russian). Archived from the original on 2015-05-15. ↑ В Борисове составлен свой список невъездных чиновников [Its own list of members of authorities who are not eligible to leave the country was created in Barysaw] (in Russian). Правозащитный центр «Весна». ↑ Назначение [appointment] (in Russian). Борисовский райисполком. 10 January 2009. ↑ ""Борисовские новости" — в новый год с новыми проблемами" ["Borisovskiye Novosti" - entering new year with new problems] (in Russian). Archived from the original on 7 April 2009. ↑ "Телерадиокомпания "СкиФ"" [Teleradiocompany "Skif"] (in Russian). 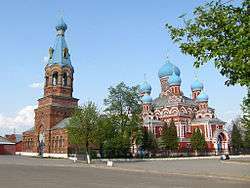 ↑ "Podolsk sister cities". Translate.google.com. Retrieved 29 April 2010. Wikimedia Commons has media related to Barysaw.